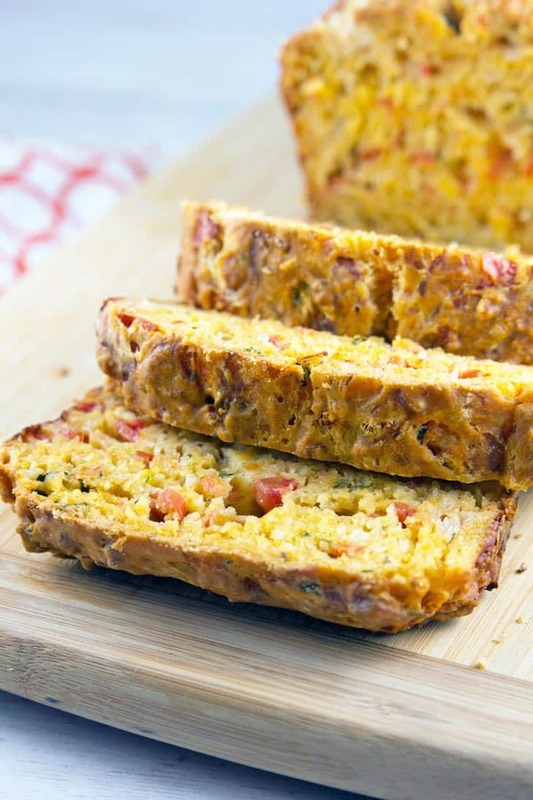 An easy savory quick bread combining fresh tomatoes, Italian herbs, garlic, and cheese. Bake up some summer right in your kitchen with this tomato bread. Once again, we’re sneaking in just under the wire for my Quick Bread of the Month. This month, we’re changing things up a bit and going savory. Typically “quick bread” conjures up the idea of a sweet, fruit-filled bread. But really, any bread that doesn’t contain yeast is a quick bread – like this herby, cheesy, tomato bread. Summer is full of extra-ripe tomatoes and this is a great way to use them, paired with fresh herbs from your garden. 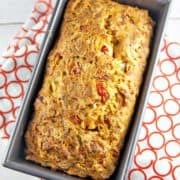 The inspiration for this tomato bread came from some leftover red and yellow tomatoes on the vine. 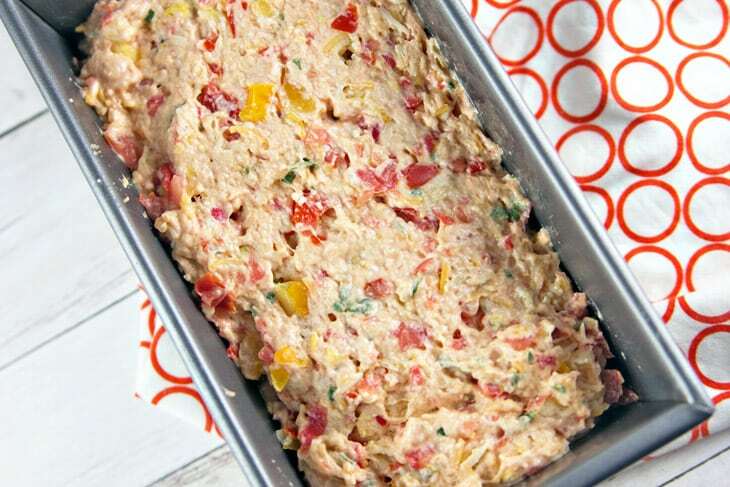 I love focaccia with fresh tomatoes, so why not impart that flavor into a quick bread? I tried searching for tomato quick bread recipes, but came up short. Really short. Almost every recipe I found used tomato sauce, a can of crushed tomatoes, sundried tomatoes in oil, or in one instance – ketchup. (Ew.) No worries – I can forge this path on my own. To the experimental kitchen, STAT! Savory quick breads are much easier than sweet, in my opinion, because there’s no need to worry about sugar. For a sweet quick bread, you want something sweet – but not too sweet. Too much or too little sugar completely changes the taste of the bread. 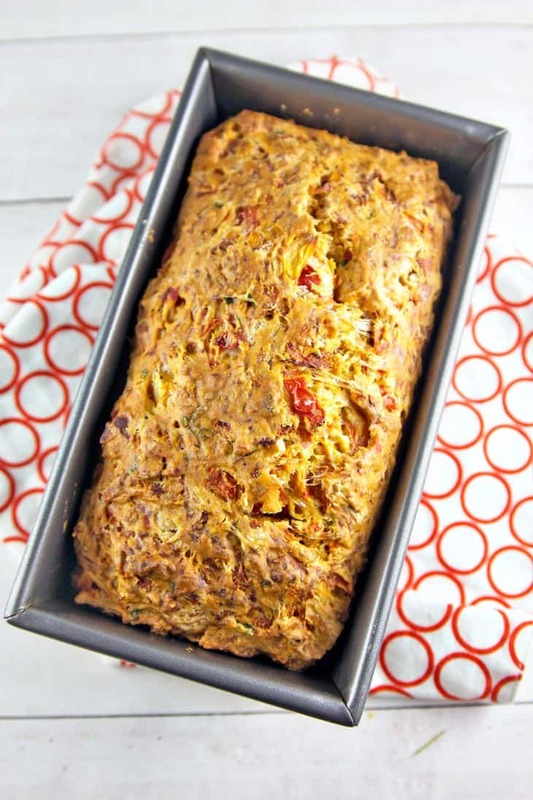 A savory quick bread, however, is just about maintaining the proper ratio of flour, liquid, eggs, and fat. Are you ready for a little kitchen chemistry? I like to use a 4:1 ratio of flour/liquid to fat/eggs. Ratios are my favorite way to bake — it means you can adapt things quickly. For a savory quick bread, I use 4 times the weight of flour and liquid as fat and eggs. Of course, it’s not quite that simple, since milk is both a liquid and a fat, eggs are roughly 75% water, etc. But if you’re like me and love this stuff, you already know all that. And if you don’t, that’s why you look for recipes from trusted sources to do the kitchen experimenting for you. Sorry, I hope I didn’t lose you there. Let’s get back to this specific bread at hand. Thanks to my handy dandy food processor, this tomato bread was really easy (once I figured out all those ratios mentioned above). Add your ripe tomatoes, some roughly chopped garlic, and a big handful of basil and oregano right into the food processor. Pulse it a few times (10-15 1-second pulses worked for me) and stir it right on in with the rest of the ingredients. Everything else can be whisked by hand. Don’t have a food processor? 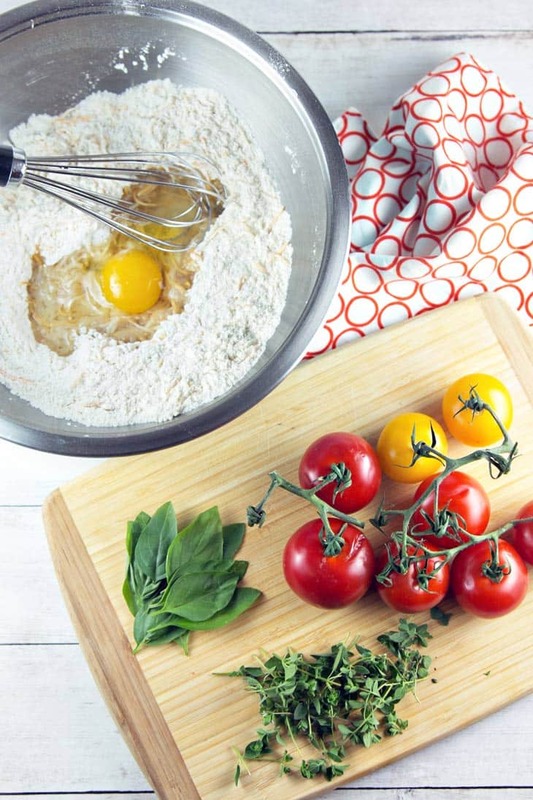 Use a blender, or chop it all by hand – just use a cutting board with a juice groove to catch the tomato juices. After all, that tomato juice is important to maintain the proper liquid ratio! Between the fresh tomatoes, the basil and oregano, and the three cloves of garlic, your kitchen will smell amazing while this bakes. Seriously, seriously amazing. I wish I could bottle the scent and spray it in my kitchen on a regular basis. Is that weird? No, I didn’t think so. I really enjoyed eating this warm, while the bread was most fragrant, but it was still quite good the next few days at room temperature. This isn’t a bread that will last for too long on the counter – thanks to the ripe tomatoes, mold will grow within a few days. Bake it and enjoy it in the next day or two. I didn’t get a chance to test it myself, but I bet it would be amazing toasted or as a savory french toast. Pop a slice of tomato bread in the toaster, let it get a little crispy, and spread on some butter. Oh, yeah. Preheat oven to 350°F. Grease an 8.5-inch loaf pan. In a large mixing bowl, whisk together flour, baking powder, baking soda, and salt. Stir in the egg, oil, and milk, followed by the grated cheese. The batter will be very thick. Combine the chopped garlic, tomatoes, basil, and oregano in a food processor. Using a series of 10-15 one-second pulses, chop the tomatoes and garlic until no large pieces remain, but mixture is not completely smooth. Fold the tomato and garlic mixture into the batter. Resulting batter will still be thick. Pour (scoop) the batter into the prepared loaf pan. Bake 45-50 minutes, until a tester inserted into the center of the bread comes out clean. Cool in pan for 10 minutes, then turn out onto a wire rack to continue cooling. Enjoy while still warm. I think I’d like a slice, toasted and smeared with chive cream cheese — please! 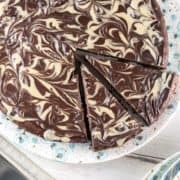 Oooh, cream cheese – great idea! This looks so easy to make and I love savory breads. Will try soon. Yes, savory breads are much more my cup of tea than sweet. I hope you love it! 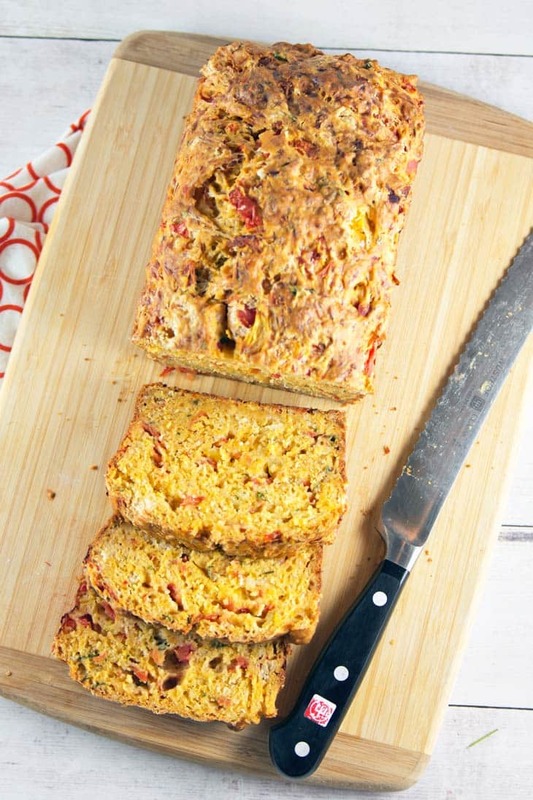 I have been wanting to do savoury breads for a long time now… this seems like a perfect start! Definitely a great place to start – could not be any easier! This bread looks delicious and moist!! I imagined this bread with mashed avocado and lime… simply delicious! Mashed avocado sounds amazing paired with this! You had me at savory bread. My hubs love quick breads so much as they’re sweet (duh!) but I’m not that ‘sweet’ of a person (if ya know what I mean). I can’t wait to try this. Yum! And so so gorgeous. I’m with you – I can generally take or leave dessert. I’m definitely more into savory or salty things! My husband is like your husband… his first comment was “It’s good, but it would be better if it was sweet with fruit and nuts.” Ha! Do you think this bread would freeze well? I do! Wrap it well in aluminum foil and store in a freezer-safe bag. I’d probably recommend toasting a slice after it thaws, but it will hold up well in the freezer. Julie, this bread looks amazing! I’m going to make this and try it as the base for a dinnertime French Toast – a savoury toast – not one with sugar or maple syrup. I’m thinking a tomato chutney for a topping. Thanks for sharing! Thanks, Byron! I absolutely love the idea of this for a savory french toast. I’ve never considered french toast a savory dinner item before, but it sounds perfect. Now I can’t stop thinking about all the great combinations for dinner french toast and various salsas or chutney! Hi there! Do you think I could cut this recipe in half or even a third? Also do you think it would work well in muffin tins? I’m cooking for a solo household and I think little muffins might make them easy to pack for lunch. I am always a little leery of halving/thirding recipes that call for a single egg, but if you mix the egg really well (blender, perhaps) and weight it out, and have the appropriate measuring spoons to measure 1/3 of a teaspoon, there is no reason this wouldn’t work in a smaller scale (and baked in the mini loaf pans). I do think this will freeze well though, so converting it to muffins and freezing a batch for later is a great option! I’d divide the batter into 12 muffins and bake at 350 for 25-30 minutes, or until a tester comes out clean. Then wrap each cooled muffin in saran wrap and store in the freezer in a freezer-safe ziploc bag. Hope this helps! I think something is missing. My mix is dryer than biscuit batter! Hi Shenelle – how did it turn out after you baked it? The recipe is written correctly; nearly all the moisture is derived from the tomatoes themselves. The mix is definitely dry and doesn’t pour like normal quick bread batter. I tried to convey this in the instructions where I mention needing to scoop/spread the batter, so readers wouldn’t think they did something wrong. My apologies if it wasn’t clear enough! 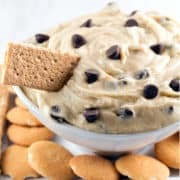 Biscuit batter is actually a really good comparison, so you are on the right track! I was thinking of selling these at a farmers market, but I’m concerned about the shelf life… what do you recommend? Shelf life is about 3 days at room temperature; freezing or refrigerating will certainly extend the life, but the bread will taste more stale under refrigeration. Is this made with regular plain flour? Yes, made with all purpose flour! I have made this three times now. The second time I added a little more oil, milk, and tomatoes. It was still dryer and more biscuit like than what I wanted. This last batch I added an extra egg and some more tomatoes and kept the other ingredients as the recipe says. It turned out the way I wanted it to. I use jumbo size eggs in all my baking. I had to lengthen the cooking time. Great recipe !!! Thanks for sharing it. Will make it many times. Glad you found a variation you like, Cliff! There seems to be a lot of variation with how much ‘juice’ the tomatoes release, so I’ve been meaning to go back and retry this recipe with cherry tomatoes vs commercial tomatoes vs homegrown heirloom tomatoes to poinpoint how much extra liquid to add for each one. Has anyone tried it with whole wheat flour yet? Or maybe half whole wheat, half white flour? Hi Jess — I’ve never tried subbing in whole wheat flour, but I would definitely add extra liquid if try this. Whole wheat flour is quite a bit drier and needs more moisture to compensate. I wound up using half whole wheat flour and half white flour. Took your recommendation and doubled the milk. This bread is delicious, thank you for sharing!! I’m sorry to hear that, Melinda! What was the problem? I’m happy to help you try to troubleshoot if you let me know what didn’t turn out right. Can I use dried herbs? Absolutely! Just halve the amount — dried herbs are generally more potent than fresh, so you’ll want to use less of them in the bread. I was wondering if you had to put the tomatoes in a blender… can you just dice them up really well? You can absolutely do a fine dice – just make sure to save all the juice as well, since it helps keep the bread moist. yum! a flavorful bread recipe. Haven’t thought of tomatoes as a bread ingredient! This savory bread looks amazing. Love the texture of this and the herbs. This recipe is fantastic, a keeper. melted. Grind over some black pepper and enjoy!! Has anyone tried using GF flour.? I will make this for Family anyways but there are a few including myself who have some problems with reg flour. Thank You for the recipe. My tomatoes are still going strong, I’m out of my ears in soups, sauces, and everything in between. 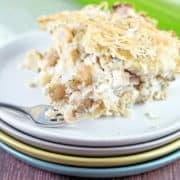 So glad I searched for this recipe, my mouth is watering!! Oh good, I hope you love it! Impressed your tomatoes are still going so late in the season — it’s definitely too cold here. Enjoy all those tomatoes! Can you use diced tomatoes in a can for this? I’ve never tried — I think the diced tomatoes tend to have a lot of excess liquid so you may find that the dough is too runny. It’s certainly worth giving it a try; I’d drain the tomatoes first but save the liquid, then add a little back in until you get an appropriate dough consistency!